York County, in southeastern Pennsylvania, the New World home of the Büdingers and von Schlegels, was not directly in the line of hostile attacks by Native Indians during the French and Indian War. Western Pennsylvania and Virginia, subject to marauding Indians, were but a day’s march from York County, Pennsylvania. In 1749, King George II signed a royal charter granting the Ohio Company two hundred thousand acres of land in the Ohio Valley of the colony of Virginia with additional three thousand acres to be added when the Ohio Company erected a fort at the Forks of the Ohio and settled the grant with two hundred families. George Washington's older half-brother was a member of the association of Virginia planters who made up the owners of the Ohio Company. George Washington, though young, but due to his experience surveying frontier land his ties to the for the Fairfax family, was selected by Virginia Governor Robert Dinwiddie to undertake an arduous journey to the French forts of the Ohio Valley. In December 1753, George Washington met with Captain Jacques Le Gardeur de Saint-Pierre at Fort Le Boeuf and delivered a Message from Governor Dinwiddie. demanding that the French withdraw from the lands claimed by Virginia west of the Allegheny Mountains. The French reply was a polite but unyielding refusal to abandon the Ohio country. Amid the hardships of the freezing December weather and ice-laden streams, Washington returned in haste to deliver the French rejection to Governor Dinwiddie. Governor Dinwiddie had been empowered by the British Crown to protect His majesty's possessions in North America. He again commissioned George Washington to lead a contingent of 160 men to dislodge the French. Washington's contingent was woefully inadequate to face the French that had been reinforced at the forks, but his contingent surprised and defeated a small French scouting party, known as the skirmish of Jumonville Glen, an action that has been said to be the first battle of the French and Indian War in North America. The war expanded world wide to be the Seven Years War between France and England. Washington established a small fortification, Fort Necessity, where he surrendered to the French in July 1754. Under terms of the surrender, Washington and his troops were released and returned to Virginia, where Washington he was cleared of blame for the defeat. ​The British ministry, deeming Americans unfit militarily to unite the colonies in common action, sent General Edward Braddock and some 1,500 regulars to America to dislodge the French. ​Colonel George Washington was assigned as an aide to British General Edward Braddock. Braddock's campaign met with a disastrous defeat July 9, 1755 by the French and a large Indian contingent at the Battle of Monongahela. Braddock was killed and the expedition ended in disaster. George Washington distinguished himself as the Hero of the Monongahela by rallying the remnant of the British and Virginian forces in their retreat. The second floor of Fort Hite was accessible only by ladder. By pulling up the ladder the second floor provided safety for women and children. Men stayed on the first floor for fighting. After the British were defeated In the Ohio valley at the battle of Monongahela, the Indians, instigated and supported by the French, became more aggressive, attacking and killing settlers on the western Virginia Virginia settlers. The settlers were largely responsible for their own defense. Neighbors gathered at local sites that afforded some protection. In Mecklenburg, Fort Shepherd was a stone house where neighbors gathered in time of an Indian onslaught. “It is said that one of Thomas Shepherd’s sons was born while the fort was besieged by a band of the bloody marauders.” Hite Fort was built near Mecklenburg, now Shepherdstown, during the French and Indian War. Governor Robert Dinwiddie appointed George Washington rebuild and command the Virginia Regiment. Writing to Washington Aaugust 14, 1755, Dinwiddie declared that "Trust in Yr Loyalty Courage & good Conduct, do by these Presents appoint You Colonel of the Virga Regimt & Commander in Chief of all the Forces now rais’d & to be rais’d for the Defence of this H: Majesty’s Colony; & for repellg the unjust & hostile Invasions of the Fr. & their Indn Allies—And You are hereby charg’d with full Power and Authority to act defensively & Offensively as You shall think for the good & Wellfare of the Service." In May 1756, overlooking the frontier town of Winchester, construction began on Fort Loudon during the French and Indian War. The fort named for the Earl of Loudon, John Campbell, was a square fortification with four bastions constructed of earth, wood and stone. Col. George Washington, commander of the Virginia Regiment, designed the fort and supervised its construction until 1756. It served as Washington's command center for a series of forts authorized by the Virginia House of Burgesses and built on the frontier that existed from the Potomac River to North Carolina. A well dug within the fort survives today in what is now the city of Winchester, Virginia. Col. George Washington established headquarters at Fort Loudon, Winchester, Virginia, located a few miles southeast of Mecklenburg. Washington organized bodies of rangers whose duties were to scour the woodlands and give notice of approach of war parties. One of these companies is of special interest to us because it was raised by Captain Robert Rutherford, composed of able-bodied young men – expert marksmen, and fearless Indian fighters. This company did very efficient service. The Forbes Expedition of 1758 was the third attempt of the English to Capture fort Duquesne from the French. General Forbes commanded upwards of 6,000 men for the expedition, including 2,000 Regulars (mainly Highlanders), as well as Provincial units from Pennsylvania and Virginia, which made up the majority of his force. George Washington commanded the Virginia Regiment of the expedition. 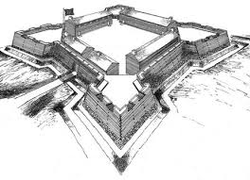 The French garrison of Fort Duquesne was in poor condition by late November 1758. Tribal allies had deserted the French, rations were low, and the walls of the fort were rotting away. Once Forbes caught wind of the French dilemma, he immediately dispatched three brigades to advance on the fort. Washington was to lead one of those brigades. The French, under the command of Captain François-Marie Le Marchand de Lignery, would not give the British the satisfaction of taking the fort. On November 24, the French burned down the fort and escaped with roughly 500 men. Washington and the others discovered the smoldering ruins the following day. With the forks in British hands, and their Native American allies deserting them, the French presence in the Ohio River Valley suffered a mortal blow. ​Washington resigned his command of the Virginia Regiment shortly thereafter, disappointed that he never received the commission in the British Army.These incidents preceded the British victory in the French and Indian War, a war which, in retrospect, played a role in the eventual British loss of their thirteen American colonies. Without threat of French invasion and less hostile action from Indians on the frontier, the American colonies saw little need for British military protection. In addition, people resented King George III’s Royal Proclamation of 1763 in which the British agreed to limit colonization of the former French territories. Kentucky, then a County of Virginia, was to be reserved as hunting grounds for the Indians whose settlements were north of the Ohio River. The European counterpart of the colonial war, the Seven Years' War, nearly doubled Britain's national debt. The Crown, seeking sources of revenue to pay off the debt, attempted to impose new taxes on its colonies. These attempts were met with increasingly stiff colonial resistance, until troops were called in so that representatives of the Crown could safely perform their duties. These acts ultimately led the colonists to armed conflict and war for independence from England. In 1758, as the hostilities between the settlers and the Indians greatly lessened in the Shenandoah Valley of Virginia, Heinrich Bietinger, or Henry Bedinger(1) as he soon became known, visited the village of Mecklenburg situated on a bluff overlooking the Potomac River in Virginia. Mecklenburg, on the main road from the eastern towns and settlements on the western frontier, was a bustling village of German craftsmen and artisans -- “mechanics”, as the historian Danske Dandridge describes them. At one time there were no less than two tanneries, two flour mills, a saw mill and a woolen factory all of which gained their operating power from Morgan’s Spring Branch which flowed through the town. Actually, the name of Mecklenburg does not occur before 1759 or 1760, and before that time people spoke of the village as Swearingen’s Ferry. It is probable that Thomas Shepherd gave the village the name of Mecklenburg when he laid out the present village about 1755 or 1756. Among the crafts brought to Colonial America by the German and Swiss gunsmiths was the rifled muzzle loader. The rifle was further developed in Pennsylvania by craftsmen as a long-barreled and extremely accurate weapon. The gunsmiths of Mecklenburg constructed the long-barreled Pennsylvania, or Kentucky rifle as it later became known, using the available simple blacksmith tools. The German gunsmiths supplied the frontier residents with rifles for hunting and defense against marauding Indians. The long-rifle was the standard arm, along with a tomahawk and hunting knife, carried by volunteers of Virginia Militia units recruited in Mecklenburg and the Shenandoah Valley during the American Revolution. The marksmanship of these Virginia volunteers would amaze the musket-bearing colonial soldiers of the northern colonies. More importantly, Virginians bearing the rifled long-guns would be a decisive force in the coming battles against the British during the war for independence. Of doubtless historical consequence and of importance to the destiny of American Colonies was the military service of the young, brash Virginian, George Washington who during the war gained military experience and showed his leadership, determination, and patriotism. Some years later, in 1775, Washington appeared at the Second Continental Congress in military uniform, signaling that he was a strong patriot and prepared for war. Although he did not seek the office of commander or even claimed he was equal to it, there was no serious competition. The Continental Congress created the Continental Army of June 14, 1775. Nominated by John Adams of Massachusetts, George Washington was appointed Major General and elected by Congress to be Commander-in-chief. Washington assumed command of the Continental Army in the battle at Cambridge, Massachusetts in July 1775, during the ongoing siege of the British forces in the city of Boston. Further Reading: George Washington in the French and Indian War. Chernow, Ron, 2010, Washington A Life, Penquin Books, 904 p.
Stark, Peter, 2018, Young Washington, Harper Collins Publisher, New York, 514 p.